Costa Rica is readily accessible by most U.S. and European air carriers. Multiple non-stop flights originate each day from Houston, Dallas, Miami, Atlanta, New York City/Newark, Los Angeles, Chicago, Charlotte and more. Choose SJO (San Jose’s Juan Santamaria International Airport) in central Costa Rica for your arrival. Our friendly driver greets you as soon as you clear Customs at SJO, easily identified holding a sign with your name. He loads your luggage into a comfortable, air-conditioned, modern shuttle. Our professional drivers are experienced, so relax and enjoy the scenic drive with no hassles. The approximate 3-hour drive goes quickly with the complimentary WiFi, snacks, and cold beverages aboard for you to enjoy. Just ask if you wish to stop along the way for a meal, restroom break, or sightseeing opportunity. They will even stop at a supermarket close to Casa Azur if you wish to shop and stock the kitchen with whatever you wish to enjoy during your stay. After arriving in San Jose, choose between a Sansa Air (www.flysansa.com) or Nature Air (www.natureair.com) commuter flight to Quepos. Several flights depart each day from San Jose and average between $60-$85 each way. Total flight time is just 20 minutes. Once on the ground in Quepos, a driver will be arranged to bring you to Casa Azur. Or, we will arrange a rental vehicle to be waiting at the Quepos Airport. It is a simple 20-minute drive from there to the entrance of Paradise Breezes, where Casa Azur awaits. A new toll road from San Jose to the coast makes driving easy. Depending if you make any stops along the way, it is about a 3.5 hour drive to reach Casa Azur from SJO. While still scenic, the toll road is less winding than the other route, with multiple lanes to safely pass other vehicles. Major rental car companies are at the international airport, and your Concierge can arrange a reservation in advance. Directions are easy, with good signage along the way to help get you to the Pacific Coast Highway in Quepos. 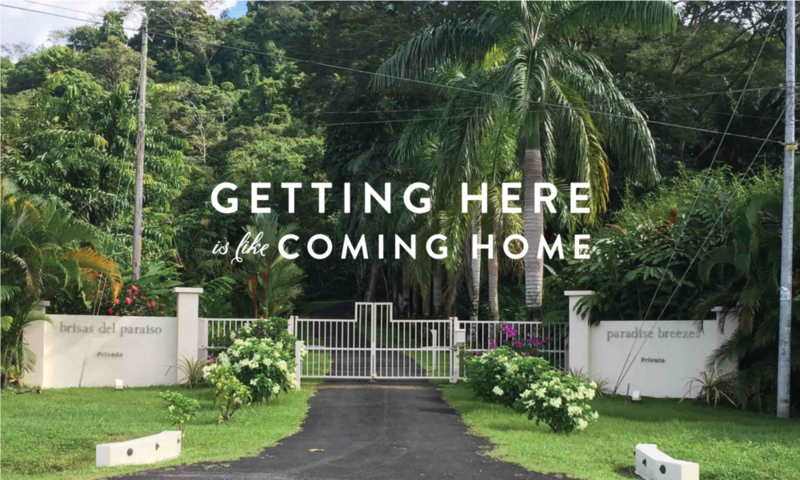 Once you reach Quepos, follow the signage to the Quepos Airport, then you know you are about 20 minutes from seeing the entrance gates to “Paradise Breezes” where Casa Azur awaits. If you want unbeatable scenery, Costa Rica is the place! The roads are not in the best shape, so plan for a 5-to-6 hour drive depending upon the weather and the time of day. Going over the mountain portion of this scenic route alone can take 2 hours before you can continue towards the better roads of the Pacific Coast Highway. You will drive over 10,000 feet upwards on a rocky and windy narrow road. Your reward, if you have the patience and courage, are great phot opportunities of some pretty amazing sights. "Located in the 150-acre tropical development of Paradise Breezes, Casa Azur is easily accessible to all the major tourist destinations along Costa Rica's Southern Pacific Coast." **NOTE: Our Concierge can arrange to have a 4x4 rental vehicle awaiting your arrival on property to use for the duration of your stay. This will allow you to easily access the many beaches, tours, restaurants and sights in the area any time you please. Contact us for competitive rental rates to avoid the hassle of doing your own research and negotiation.